You are what you think. How you think and the thoughts you think determine how you feel, perceive the world, and act. You control your brain. There is a continuum of Alzheimer's caregiving that runs from Burden to Joy. 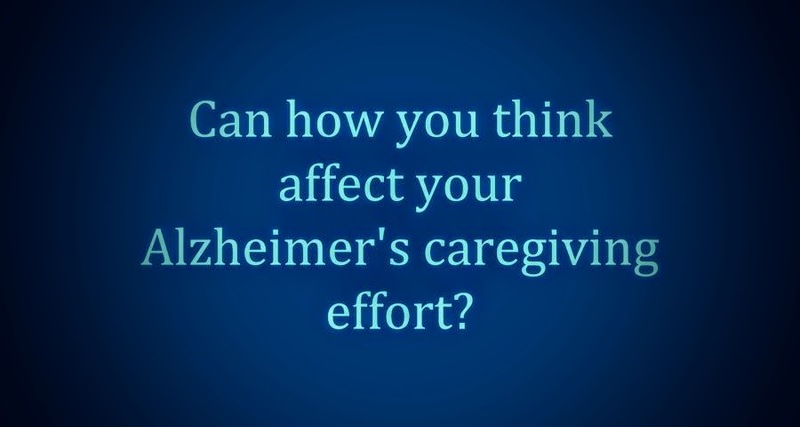 Can how you think affect your Alzheimer's caregiving effort? Can how you act effect your caregiving effort? Can how you talk and the words you use effect your caregiving effort? Can how you speak to a person living with Alzheimer's effect how they feel and act? Over the years, I watched a long list of caregivers move along the continuum from Burden to Joy. I watched. I payed attention. Like most, I started at Burden. 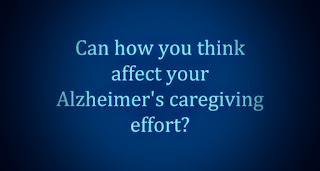 I started there even though I chose to be an Alzheimer's caregiver. Article - banged my head against the wall. a 100 or more times. I am no different than any other caregiver in that respect. It took years but I finally learned how to leave the burden behind. And then, after many years I finally started to feel the Joy. I guess you could say I made it to the promised land of Alzheimer's caregiving. That is how it felt for me. The way you think. The thoughts you think. The way you interact with others all affect your outlook on life. When Alzheimer's or dementia strikes it is very easy to start thinking negatively. In fact, the negativity of the situation can dominate you. Now we get to my point. If you want to think positive you have to start by training your brain to think positive about what you are accomplishing day in and day out as a caregiver. You have to think and do the positive. In life, when I say please and thank you, I usually get a positive response. At the minimum a nice smile. My brain registers everyone of these smiles and I feel happy -- and positive. I am now remembering the first time I thought to myself, it is a lot easier to think positively than negatively. It is a tremendous burden to think negatively in my opinion. It saps you of your energy. When you think positive you become energized, you recognize your accomplishment and thrive as a result. When you think positively you feel good, kinda bright eyed and bushy tailed. When you think negatively you feel bad, kinda like a very mild mild form of depression. So when Alzheimer's strikes, you probably went over to the dark side for a while. The burden psychologically and emotionally is enormous. I actually thought and concluded a long time ago that one of the most sinister sides of Alzheimer's is that it not only kills the brain of a person living with Alzheimer's, it is going to try and kill the brain of the Alzheimer's caregiver. How else can you explain that 40 percent of Alzheimer's caregivers suffer from depression; or, a form of deep sadness. So you see, when you live a life surrounded by Alzheimer's it is very easy to go over to the dark side. For me, I decided to get out of the Alzheimer's cave, and start living life along with my mom. Actually, I decided that Dotty and I would begin living our life anew. I looked Alzheimer's right in the eye. I no longer banged my head against the wall or rode the hamster wheel. Well maybe I did on occasion. You have to convince your brain to think positive. Your brain is no different than your stomach. You control your brain, it does not control you. So if you start doing little positive things over and over, sooner or later your brain will come along for the ride. When I was over on the dark side - burden -, when Dotty would continually tell me she was hungry, I would get upset, angry, confused and bent out of shape. Then I would get bent worse when Dotty would act negatively towards me. After I made it to the World, I accepted that Dotty was going to be hungry all the time. I could actually predict when Dotty was going to say - I'm hungry. I could see it coming. I was finally paying attention to Dotty, and not making it all about me. I learned to chuckle at myself, and Dotty. No, I am not perfect. Sometimes I snapped at Dotty and told her you just ate, or worse, I tried to explain to her she just ate. Finally Dotty and I learned how to converse in Alzheimer's World. When she would say she was hungry I would respond, okay, we will eat soon. This usually this satisfied her. We both ended up thinking positively. It is important to think positive. I can assure you, if you think negative the person living with Alzheimer's will be more than happy to accommodate you. And, so will Alzheimer's disease. One word describes this state - burden. I remain convinced that the cumulative acts we perform each day determine the quality of life we lead as a caregiver to a person living with dementia.